Tap water (running water, city water, town water, municipal water, etc.) is water supplied to a tap (valve). Its uses include drinking, washing, cooking, and the flushing of toilets. Indoor tap water is distributed through "indoor plumbing", which has existed since antiquity but was available to very few people until the second half of the 19th century when it began to spread in popularity in what are now developed countries. Tap water became common in many regions during the 20th century, and is now lacking mainly among people in poverty, especially in developing countries. Tap water is often culturally assumed to be drinking water, especially in developed countries. Usually it is potable, although water quality problems are not rare. Household water purification methods such as water filters, boiling, or distillation can be used when tap water's potability is doubted. The application of technologies (such as water treatment plants) involved in providing clean water to homes, businesses, and public buildings is a major subfield of sanitary engineering. Calling a water supply "tap water" distinguishes it from the other main types of fresh water which may be available; these include water from rainwater-collecting cisterns, water from village pumps or town pumps, water from wells, or water carried from streams, rivers, or lakes (whose potability may vary). Publicly available treated water has historically been associated with major increases in life expectancy and improved public health. Water-borne diseases are vastly reduced by proper sewage and fresh water availability. Providing tap water to large urban or suburban populations requires a complex and carefully designed system of collection, storage, treatment and distribution, and is commonly the responsibility of a government agency, often the same agency responsible for the removal and treatment of clean water. Specific chemical compounds are often taken out of tap water during the treatment process to adjust the pH or remove contaminants, and chlorine may be added to kill biological toxins. Local geological conditions affecting groundwater are determining factors for the presence of various metal ions, often rendering the water "soft" or "hard". Tap water remains susceptible to biological or chemical contamination. In the event of contamination deemed dangerous to public health, government officials typically issue an advisory regarding water consumption. In the case of biological contamination, residents are usually advised to boil their water before consumption or to use bottled water as an alternative. In the case of chemical contamination, residents may be advised to refrain from consuming tap water entirely until the matter is resolved. This supply may come from several possible sources. Processed water from creeks, streams, rivers, lakes, rainwater, etc. Domestic water systems have been evolving since people first located their homes near a running water supply, such as a stream or river. The water flow also allowed sending waste water away from the residences. Modern indoor plumbing delivers clean, safe, potable water to each service point in the distribution system. It is important that the clean water not be contaminated by the waste water (disposal) side of the process system. Historically, this contamination of drinking water has been the largest killer of humans. 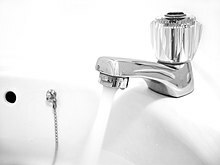 Tap water can sometimes appear cloudy, often mistaken for mineral impurities in the water. It is usually caused by air bubbles coming out of solution due to change in temperature or pressure. Because cold water holds more air than warm water, small bubbles will appear in water. It has a high dissolved gas content that is heated or depressurized, which reduces how much dissolved gas the water can hold. The harmless cloudiness of the water disappears quickly as the gas is released from the water. Domestic hot water is provided by means of water heater appliances, or through district heating. The hot water from these units is then piped to the various fixtures and appliances that require hot water, such as lavatories, sinks, bathtubs, showers, washing machines, and dishwashers. Everything in a building that uses water falls under one of two categories; fixture or appliance. As the consumption points above perform their function, most produce waste/sewage components that will require removal by the waste/sewage side of the system. The minimum is an air gap. See cross connection control & backflow prevention for an overview of backflow prevention methods and devices currently in use, both through the use of mechanical and physical principles. Fixtures are devices that use water without an additional source of power. Potable water supply systems are composed of pipes, fittings and valves. Other materials, if the pipes made from them have been let into circulation and the widespread use in the construction of the water supply systems. For many centuries, water pipes were made of lead, because of its ease of processing and durability. The use of lead pipes was a cause of health problems due to ignorance of the dangers of lead on the human body, which causes miscarriages and high death rates of newborns. Lead pipes, which were installed mostly in the late 1800s in the US, are still common today, much of which are located in the Northeast and the Midwest. Their impact is relatively small due to the fouling of pipes and stone cessation of the evolution of lead in the water; however, lead pipes are still detrimental. Most of the lead pipes that exist today are being removed and replaced with the more common material, copper or some type of plastic. Remnants of pipes in some languages are the names of the experts involved in the execution, reparation, maintenance, and installation of water supply systems, which have been formed from the Latin word 'lead', English word 'plumber', French word, 'plombier'. Before a water supply system is constructed or modified, the designer and contractor need to consult the local plumbing code and obtain a building permit prior to construction. Even replacing an existing water heater may require a permit and inspection of the work. The US national standard for potable water piping guidelines is NSF/ANSI 61 certified materials. NSF/ANSI also sets standards for certifying polytanks, though the FDA approves the materials. National and local fire codes should be integrated in the design phase of the water system too to prevent "failure to comply with regulations" notices. Some areas of the United States require on-site water reserves of potable and fire water by law. Wastewater from various appliances, fixtures, and taps is transferred to the waste and sewage removal system via the sewage drain system to treatment plants. This system consists of larger diameter piping, water traps, and ventilation to prevent toxic gases from entering the living space. Water flow through a tap can be reduced by inexpensive small plastic flow reducers. These restrict flow between 15 and 50%, aiding water conservation and reducing the burden on both water supply and treatment facilities. Both lack scientific support. In reality, both tap water and bottled water are usually safe, although in both cases exceptions can occur. The University of Cincinnati recently completed a Tap Water Quality Analysis, funded by PUR, for major US cities. Its findings show generally safe water quality in most regions. While most US cities have what is considered safe tap water, contaminants ranging from bacteria to heavy metals are present in some tap water, and occasionally serious violations of tap water standards have been well-publicized, such as the severe 1993 Cryptosporidium outbreak in Milwaukee, Wisconsin, which led to several deaths and around 400,000 illnesses (see: Milwaukee Cryptosporidium outbreak). Regarding bottled water quality perceptions and reality, in 1999, the Natural Resources Defense Council (NRDC) released controversial findings from a 4-year study on bottled water. The results of this study claimed that one-third of the waters tested contained levels of contamination—including synthetic organic chemicals, bacteria, and arsenic—in at least one sample that exceeded allowable limits under either state or bottled water industry standards or guidelines. However, the bottled water industry was quick to dispute the claim, saying bottled water is one of the most highly regulated food products under the FDA regulatory authority and that the FDA system worked extremely well when coupled with the International Bottled Water Association's Model Code and unannounced inspections. Using tap water (whether straight from the tap or filtered first) is generally considered to be better for one's environmental impact than habitually drinking bottled water, because the bottling and distribution of bottled water consumes resources and produces emissions (electricity and oil to make the bottles, diesel fuel to truck the filled bottles through the supply chain, truck exhaust, powerplant emissions, bottle recycling, and so on). In comparison, the water treatment plant activities were going to happen anyway in either case, but the other costs and effects are avoided in the tap water case. Many municipalities in the United States are making an effort to use tap water over bottled water on government properties and events. However, others voted the idea down, including voters in the state of Washington, who repealed a bottled water tax via citizen initiative. James Workman, author of the book Heart of Dryness: How the Last Bushmen Can Help Us Endure the Coming Age of Permanent Drought and co-founder of SmartMarkets says that he doesn't believe that "tap water is bad and bottled water is good". Rather he cites differences in quality regulations and standards. "Bottled water is often tap water put through another filter and not held to the same quality regulations as public utility water is." Chlorine is a disinfectant which is added to tap water in the United States. Chlorine can leave organic material like trihalomethanes and haloacetic acids in the water. The level of chlorine found is small, 1L of chlorinated water gives 0.2 mg of chlorine, which has not been found to cause any health problems. ^ "Tap Water Quality Analysis"
^ "NRDC: Summary Findings of NRDC's 1999 Bottled Water Report". nrdc.org. Retrieved 21 May 2015. ^ "Key Message Points". bottledwater.org. Retrieved 21 May 2015. ^ Saucerman, Linda (September 2007). Chlorine. The Rosen Publishing Group. ISBN 9781404219625. The Water Information Center - An online resource for public water system basics and water management issues from the National Academy of Sciences. US. Centers for Disease Control and Prevention (CDC) Healthy Water - Public Water Systems - One-stop resource for information on public water systems supplying tap water including information on drinking water, fluoridation, water testing, water-related diseases and contaminants, etc., plus links to EPA, WHO, and other resources. This page was last edited on 26 March 2019, at 00:01 (UTC).